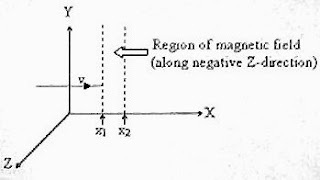 (a) The magnetic force on a moving charge is always perpendicular to the magnetic field and hence no work is done by the field. The kinetic energy and the speed of the charged particle therefore remain unchanged. [You might have noted the adjective ‘static’ with the magnetic field. If the magnetic field has a time variation, there will be induced electromotive force, which will change the speed of the charged particle (as in a betatron)]. r = mv/qB where ‘m’ is the mass, ‘q’ is the charge and ‘v’ is the speed of the particle and B is the magnetic flux density.Instead of a circular path, a spiral path is therefore followed by the particle. [We have equated the centripetal force to the magnetic force]. The charged particle therefore moves along a helical path within the magnetic field. (d) The charged particle will move along a semicircular path just before crossing the magnetic field (fig.). 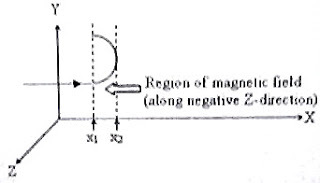 The direction of the curve is obtained by applying Fleming’s left hand rule for the magnetic force. If the velocity of the particle is slightly greater than the velocity for traversing the semicircle, it will cross the magnetic field. Therefore, the required limiting velocity is the velocity for the motion along the semicircle within the magnetic field region.